On 10 February, 15.8 million Sri Lankans will be eligible to elect 8,293 members to 24 municipal councils, 41 urban councils and 276 divisional councils. Colossal economic and social waste plague the country in untold proportions. It is thus imperative for all Local Government bodies to identify root causes and enforce a plan of remedial action. Two prerequisites here are: (i) arresting the waste of human talent and instead mobilising this asset and (ii) minimising unwanted dependency through inclusion, empowering and equal opportunity. Almost all of us will spend some of our time living with deficiency in ability: moving, seeing, physical coordination, etc. Sri Lanka has a fast-aging population, 16% of which will soon be over 65 years old. A wide and diverse range of our population – at least 20% - continue to cry louder over twenty years concerning their marginalisation, social exclusion and safety, and thereby loss of dignity and productive opportunities in day-to-day life. 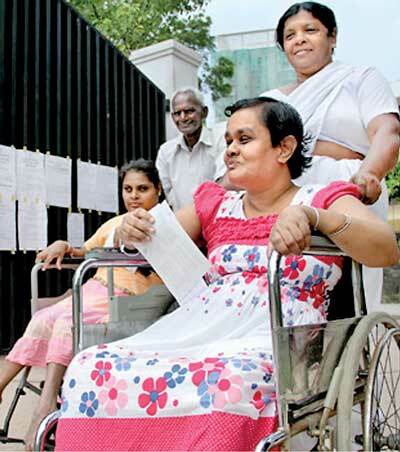 On 30 March 2007, Sri Lanka signed the UN Convention on the Rights of Persons with Disabilities. Accessibility is a key human rights issue and one of the eight pillars on which this convention stands. Hence, mayors and Local Government councils must recognise and respect that accessibility for all is not an option but indispensable. Practices in issuing certificates of conformity by Local Government bodies, concerning all parts of buildings the public needs to use in daily life often still violate the Supreme Court orders of 27 April 2011. Such injurious action is not only a violation of a human rights issue and non-compliance with the abovementioned UN Convention but also end-up dis-abling society – a major setback to the Megapolis agenda. Mayoral and other candidates must realise the colossal waste of human talent and potential - the country’s greatest resource - through exclusion. They must also implement on fast track plans for complying with the legislation that all members of Parliament have unanimously approved on 20 March 2007. None of the rooms and ball rooms in many 5-star hotels and not a single ward in just-opened hospitals, even in Colombo, amazingly have even one accessible toilet. Even in Megapolis territories, hardly any ATM machines, supermarkets, educational institutions, sports complexes and mushrooming glamorous posh restaurants can be accessed and used even by those ambulant and affected by debilitating medical conditions. The victims here are the eligible voters and their ability-restricted children - not fewer than three million in number – who have been robbed of their ability to see, walk, climb or even stand steadily, to a greater or lesser extent, permanently or temporarily by accidents, numerous debilitating medical conditions, wear & tear of the body, and the ended 30 years of war. Rights of voters to enjoy education, employment, shopping, recreation, tourism and travel, therefore are often denied by Local Government bodies - overlooking their legal obligations and social responsibility. Often these critical shortcomings also pose safety hazards. More than one in six voters are thus often unable to ensure for themselves the necessities of day-to-day life by themselves. But, still, properly built accessible facilities could reverse this trend to a significant degree. Mayors elected on 10 February shall be leaders of their respective local body. They are also the organisers appointed by the top leaders of all major political parties. Indeed it is a national tragedy that hardly any of these 8,293 men and women seeking our votes to be our leaders of tomorrow, see this country’s largest minority group, a huge voting base when their families are also added. The measures required to comply with legislation are low cost and easily feasible. As violators of SC orders are often backed by political powers, Local Government bodies shamelessly tend to succumb and allow violators to go free: the victims must either plead and earn the good-will of violators or suffer further. The Supreme Court has recognised the unlawful playing with precious human life causing safety hazards. It has ruled that failure to refrain from issuing certificates of conformity, where there is anything less than full compliance with its 2011 April orders, shall be considered as a serious punishable offence attracting punitive repercussions, including for Mayors and Commissioners. Please note: the Supreme Court gives the liberty for anyone to file a motion under its given order SCFR 221/2009 regarding any violation through failure of compliance. Access for all really means access to justice, which can no more be delayed under a true and truthful good governance. Local bodies should respect the fact that the way a country treats its ‘dis-Abled’ population is an internationally recognised measure of a country’s good governance, and a far more telling indicator of a society’s development than GDP. Mayors and their teams, on a high-priority basis, should establish a workable mechanism for the effective enforcement and implementation of legislation to prevent issuing of COCs to facilities failing to comply. It is equally crucial to make the public clearly aware of such measures in advance. Newly elected Local Government bodies should immediately investigate compliance regarding essential facilities the public need to use in daily life (toilets in particular )in the following: hotels and places of tourist attractions, restaurants, institutions of secondary and tertiary education and vocational training, wards and counters in hospitals, banks, sports stadiums, all Government and private sector facilities at upcoming cities, towns, basic urban infrastructures and services - including train and bus facilities - within Megapolis and Port City territories. Business leaders should be reminded of the fact that safety and inclusion of all customers by physical design is paramount for the growth of businesses and to maximise its potential. In working closely with the Ministry of Tourism, the star-status awarding procedures to hotels must be remedied immediately, making total (not partial) compliance with accessibility legislations mandatory. We witness fast-growing ability-restricted senior touring populations of the world demanding their right for equal access. With their high spending potential, they are an unrecognised but growing niche - certainly an overlooked growth market. This requires that tourist establishments and essential facilities must truly meet accepted design standards. Hence, accessibility in tourism, all hoteliers must be reminded, is an indispensable economic element. Most accident victims continue to find physical access to courts a nightmare. Therefore Local Government bodies should ensure all new and renovated court complexes comply with the abovementioned Supreme Court Orders for accessibility. To make these crucial initiatives a meaningful reality, municipal councils must enforce a system of independent physical audits and checks to establish compliance with accessibility legislations. Accessibility experts perform a highly responsible specialised job, involving money, time and effort concerning precious human life. It requires a good in-depth understanding of intricacies, years of practical experience and thorough working knowledge beyond text-book material. It is not one where standards and specifications can simply be read and applied. Looking at reality proves that the absence of experienced accessibility experts is a very costly blunder that fuels social exclusion and loss of business opportunities and good name. Hence, municipal councils and major urban councils very much need the services of accessibility experts as advisors. We hope that this article will be an 11th hour eye-opener to all mayoral candidates and their teams. May they make clear public announcements indicating a proposed plan of action on fast track, so that for the fast-increasing and biggest minority group of voters, the degree of their mobility should no more be a disadvantage caused by physical and architectural barriers, and thereby everyday activities should no more be a daunting task to accomplish with safety and with dignity. Remember, although the largest minority, they have no voice in Parliament or even in the Local Government bodies to be formed. At least all municipal councils should have one independent dis-abled council member appointed by the mayor to rectify this major shortcoming.